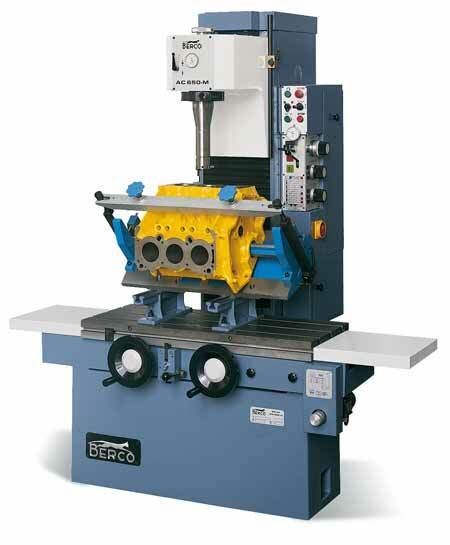 The Berco AC650M is a dedicated vertical boring machine designed primarily for the machining of vehicle engine cylinder bores. It also features a powered surface table enabling the machining of horizontal surfaces including cylinder block gasket surfaces. Using a system of interchangeable boring heads it is capable of boring diameters from 31 – 125mm. The surface table (1000 x 400mm) can accommodate large work pieces and the table movement allows 830mm horizontal machining capacity. 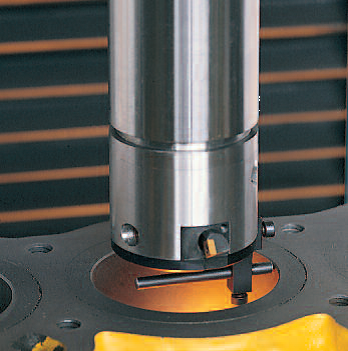 The 500mm free space between boring tool and surface table means that even taller blocks can be accommodated. A combination of six spindle rotation speeds and three vertical feed rates allow the speed and feed to be selected to best match to the job in hand. A choice of two surface table feed rates are also available. The work piece is first mounted on the surface table and securely clamped in position using dedicated machine clamps. When preparing to machine a cylinder block the relevant bore is positioned below the boring head by moving the adjustable surface table. Using the rapid down- feed function the boring column is entered into the bore. With the aid of the in-built centring stylus and dial gauge the column can then be centred exactly within the diameter to be machined. Once centred, the surface table is locked into position and the column withdrawn prior to tool installation. Various tool holders, tool lengths and profiles are available to cover the wide diameter range and the one most suited to the job requirements is selected prior to setting. The tool holders are equipped with removable boring tips which are available in a variety of grades. The most suitable grade is selected to suit the material being worked on and the cutter diameter is set using a dedicated micrometer setting device. Once set, the tool is fixed into the boring head and the safety guards put in place. The appropriate spindle speed and feed rates are selected and the cylinder boring operation can begin. The spindle motor is started and the column travel lever engaged to feed the tooling down the bore. The machine incorporates an automatic switch off which can be set to operate at any column depth which means that consistent and accurate bore lengths are achievable. When machining for counter-bores (when fitting flanged type cylinder liners for example), the additional column dial gauge is used to ensure complete accuracy. After machining is complete the column is again withdrawn from the bored hole and the whole process repeated for each adjacent bore. With the aid of the specialised tooling listed below a number of additional complex machining operations are also possible. This piece of tooling allows the cutting tool to feed outwards creating ever larger diameters as the boring spindle rotates. 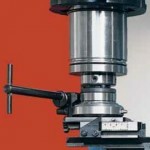 This enables large diameter pockets to be machined accurately. This facility would be used when machining recessed head gasket faces such as those found in Porsche engines. It has also been used in the machining of alloy wheel hubs when reducing wheel offset and for machining gearbox casings to reduce their length in a specialist conversion. This special bush fits into the boring column in place of the boring head and allows the use of several extra pieces of tooling including an extra small boring bar and morse taper attachments. 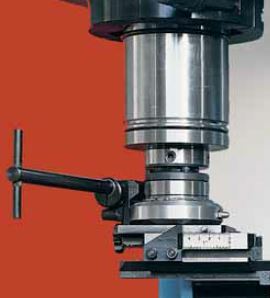 The extra small boring bar can be used to machine diameters from 17 – 31mm. It is ideal for machining bush housings in castings and even small end bushes in connecting rods. The morse taper attachments permit a whole range of additional drilling and reaming tooling to be utilised opening up many extra possibilities for unusual engineering jobs to be tackled.